After withdrawing at Torrey Pines, the Tiger world ranking has finally dipped to its lowest point since the year he turned professional in 1996. He won in Las Vegas soon after joining the paid ranks, and by the start of 1997 was already up to 23rd, with his runaway Masters victory that April hoisting him to 2nd. By June he had reached the pinnacle of the world game less than a year after turning pro and would go on to top the rankings for 683 weeks in total (that’s over 13 years, in case you’re interested! ), including 281 weeks consecutively and eight full years where nobody could touch him (2000 to 2003 and 2006 to 2009). Only two other players have topped the rankings for an entire calendar year – Nick Faldo in 1993 and Greg Norman in 1996, despite the Masters collapse that saw Faldo claim his third Green Jacket. Among his many astonishing world ranking records are the highest ever average points total, when he reached 32.44 points just before the 2001 US Open, and the biggest ever lead just before that when he stood 19.4 points ahead of second-placed Phil Mickelson. 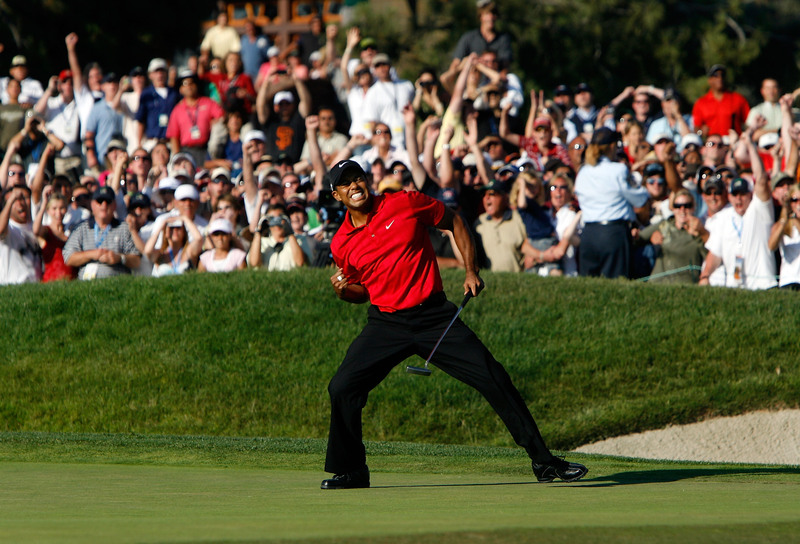 Perhaps more remarkable still is that after winning the 2008 US Open play-off on one leg (below), he didn’t play again until the following year’s WGC Accenture Matchplay in late February 2009, at which point no-one had been able to displace him from the number one spot. Injuries, swing changes and indiscretions have affected his ranking adversely at times since then, but even amid the scandal of 2009 and on into 2010’s self-enforced lay-off, he only fell to 58th. And those who think that was the beginning of the end should remember that he was back to number one by April 2013, a season in which he won five times and claimed the Player of the Year crown. This time round, age, injury, surgery and seeming swing and short-game meltdown paint a bleaker picture of the ongoing prognosis, with Phoenix seeing his highest ever score as a professional (82) and Torrey Pines proving to be the third tournament in a row in which Tiger chipped like a zero-confidence 20-handicapper. With T25th in the 2014 WGC Cadillac Championship his best finish in the last 18 months, Tiger has been banking up precious few world ranking points, and without a highly unlikely dramatic reversal of fortunes, it seems golf’s ultimate world number one will be outside the Top 100 within weeks rather than months. Is there any way back? Never say never, but few would bet on such an outcome right now.